City of Parkersburg » Why Recycle? When you weigh all the benefits of recycling, the real question is why not recycle? When you consider its impact, the choice to recycle becomes more clear. Taking just a moment to put your newspaper, soda can, or milk jug in the recycling bin saves an invaluable amount of time for all of us in protecting us from environmental harm, overflowing landfills, and natural resource depletion. Click on the links below to learn more about why recycling is important for you and for the environment. The EPA has found that recycling a ton of paper takes 60% less energy than producing it from virgin tree pulp, 50% less water, and saves four barrels of oil. 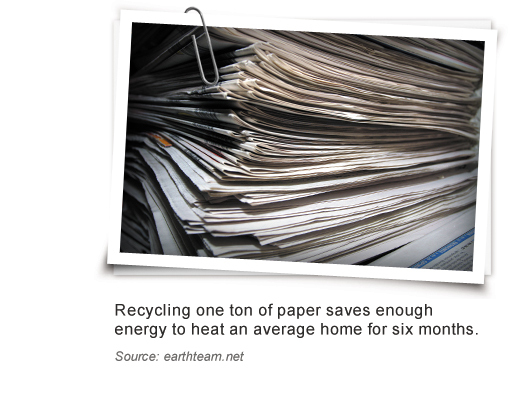 Preventing one ton of paper waste saves between 15 and 17 mature trees. 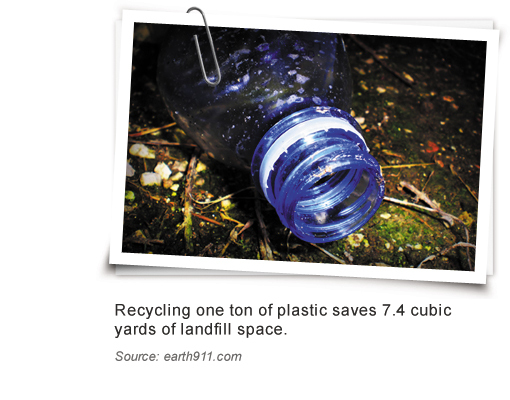 Recycling plastic takes 70% less energy needed than creating it from raw materials. Also, making new plastic requires significant amounts of fossil fuels. Studies suggest that between 7% and 8% of the world’s fossil fuels are used in producing new plastics. 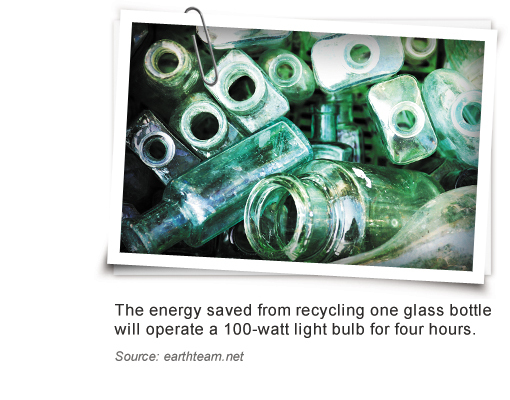 Recycling a glass bottle saves enough energy to light a 100-watt bulb for four hours. Glass can be recycled an endless number of times, and recycling it takes 20% less energy than making it from sand, soda ash and limestone. 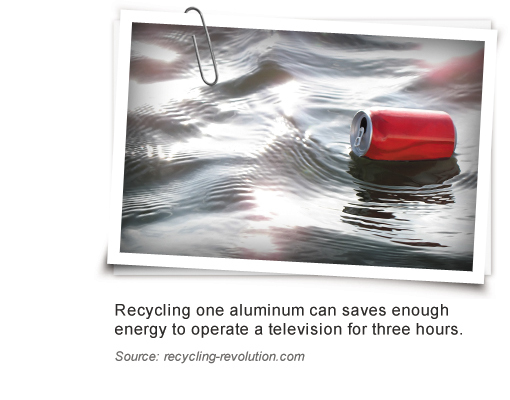 Because of the way aluminum is made, and because you can recycle it over and over, recycling it saves a lot of energy. Using recycled aluminum scrap to make new aluminum cans, for example, uses 95% less energy than making aluminum cans from bauxite ore, the raw material used to make aluminum. Recycling steel takes 75% less energy than to make steel from iron ore. When you recycle steel, you save precious resources that make up its composition such as iron, nickel and chromium. Every day people throw away trash. Some is recycled, but much of it will be picked up by garbage trucks and taken to a sanitary landfill. Operating practices of a modern sanitary landfill include compacting and covering waste at the end of each day in order to reduce odor; control litter, insects and rodents; prevent contamination of the local environment, including groundwater, thereby protecting the public health. Compacting and covering the waste each day creates air-tight, light-free deposits within the landfill, prohibiting biodegradation. The biodegradation process requires oxygen, sunlight and moisture. In effect, we are burying our waste in a big hole in the ground, and it will be there forever. By recycling everything we can, we can conserve three cubic yards or more of landfill space per ton of recycled material. Since recycling reduces the amount of energy used by industry, it reduces greenhouse gas emissions, which helps prevent global warming. This is because much of the energy used in industrial processes and in transportation involves burning the most significant sources of carbon and other greenhouse gas emissions into the environment: fossil fuels like gasoline, diesel and coal. Also, the energy conserved in recycling from burning less fossil fuel results in less water and air pollution. Recycling is not only good for the environment, it’s also good for the economy. In fact, some recycling-based manufacturers create 60 times more employment positions on a per-ton basis than those created in maintaining landfills. Recycling can help to reduce litter, which can be harmful to wildlife. Animals can be injured or killed by the trash we throw on the ground. 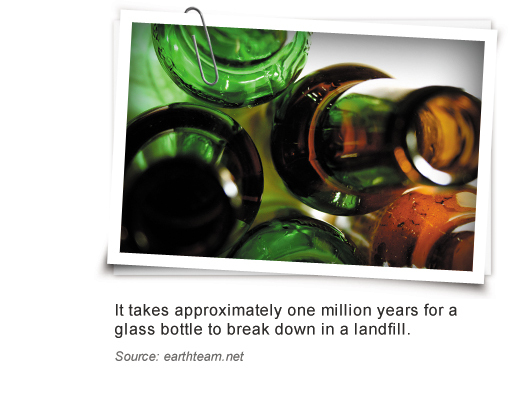 A piece of paper may take two and a half months to biodegrade, but a glass jar could lie around for 4000 years. The openings of jars left on the ground can trap the heads of small animals searching for food. The conservation of natural resources is also the conservation of habitat and preservation of biodiversity. If new products are made from recyclable resources, virgin resources are not obtained through mining, timbering and drilling.